Some genealogy news just can’t wait for Upfront with NGS Mini Bytes to be published (bi-weekly) nor is substantive enough as the topic for a blog that only posts 1 message a day! And, when there are at least two bits of time sensitive news that need to be conveyed, it is time for a post! Is there other "time-sensitive" news that genealogists and family historians need to be made aware of? 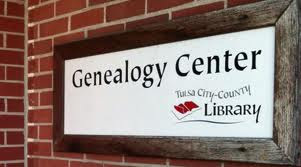 To our friends inquiring about the Genealogy Center: After 14 years in our current location, we have decided to relocate our Genealogy Center to Hardesty Regional Library. This improvement provides a much larger facility for an ever-expanding collection and expanded hours of operation by 27 more hours a week for greater access to information. Further, our current location does not have sufficient meeting room space which is why most genealogy events are actually held at Hardesty already. It's a common practice to locate genealogy centers within existing libraries for obvious reasons -- all customers enjoy greater access to more materials, information, events and activities. We thank you for your ongoing support for genealogy and we share your passion for this important service.